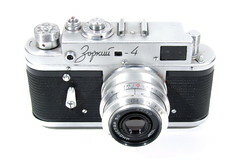 The Zorki 4 is a 35mm rangefinder camera, manufactured by KMZ near Moscow in the former USSR. Produced between 1956 and 1973, there were 1715677 made in the time. ЗОРКИЙ = Zorki means 'sharp sight' in Russian. 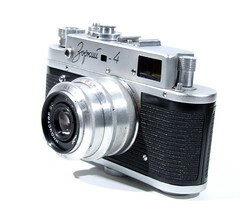 The Zorki-4 was possibly the most popular of all Zorki cameras and the first to be exported in large numbers to the west. Exported versions are easily identified as they have text in Latin script whereas those produced for the domestic market have Cyrillic text. When the Zorki-4 rangefinder was introduced in 1956, its contemporaries included the Zorki 2S, FED 2b, Leica M3 (introduced two years before), Leica IIIg, Nikon S2, Canon VT. The Zorki 4's production run outlasted all of them. When it morphed into the Zorki 4K by 1973, its contemporaries included the FED 4b, Leica M5, Nikon F2, Canon F-1 and Canon Canonet QL 17 GIII. The Zorki-4 is basically a Zorki 3S with a self-timer. It retained all of the features and strong points of the 3S. The early bodies have vulcanite body covering, engraved shutter speeds and strap lugs. Later bodies (post ~1965) have a fabric nylon covering and a more modern shutter speed progression; 1s, 1/2, 1/4, 1/8, 1/15, 1/30, 1/60, 1/125, 1/250, 1/500, 1/1000; which are silk-screened not engraved. By the mid-sixties, the strap lugs had disappeared. 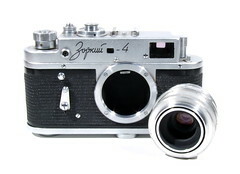 Lens: Zorki-4 was supplied with either a Jupiter-8 (ЮПИТЕР) 50mm f/2, or a Industar-50 (ИНДУСТАР) 50mm f/3.5 lens; several other lenses were available. Focusing: Matching yellow rangefinder images in the finder using focus ring on the lens; can also do scale focusing with and distance markings and a depth of field scale on the lens. Shutter: Horizontal focal plane, rubberized silk double cloth curtain, speeds: 1s-1/1000 + Bulb, speed setting dial on the top plate, lift and turn after advancing the film! Viewfinder: Large and bright coupled viewfinder/rangefinder, 1:1 view with 50mm lenses. Take-up spool: special, not captive, there is a small pin for attaching the film perforates on it. Later models don't have a removable spool. 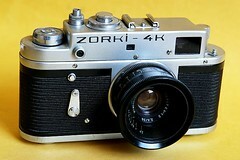 The Zorki 4K was produced from 1972 to 1978. It usually came fitted with a black Jupiter-8 50mm f/2 or on earlier models an Industar-50 50mm f/3.5 lens. Domestic models were marked in Cyrillic: Зоркий-4K. 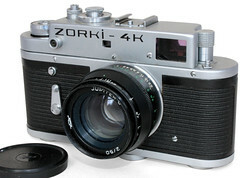 The Zorki 4K is basically a later model Zorki 4 with the addition of an film advance lever instead of the knurled knob. One minor change was making the tripod mount 1/4" instead of 3/8". On the back of the camera the KMZ logo was moved to the left so it would not be covered by the advance lever and leave room for a rubber lever stop. A source for a manual is Mike Butkus' website. This page was last edited on 5 May 2017, at 05:35.